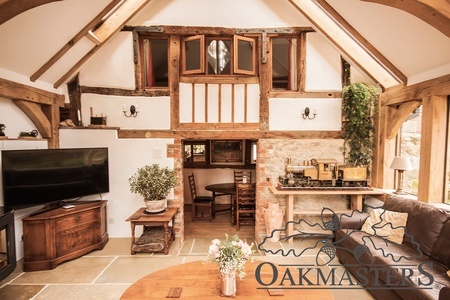 Oakmasters is a family business, specialising in the design, engineering and manufacture of luxury bespoke oak framed and glulam timber framed buildings. We can help you create the space you have always wanted. We use innovative methods and techniques in combination with traditional hand craftsmanship to produce oak and glulam timber frames for newbuild and renovation projects, both residential and commercial. Our products range from from simple oak porches, through luxury hand finished oak roof components and oak beams, to full oak frame houses and oak extensions. Recently, we have added glulam timber structures to our capabilities. Most of our projects can also be designed in glulam timber, which is specifically suitable for larger, challenging timber structures. Our services range from supply only, to supply and build packages. Whatever stage you are at, whether you are starting from scratch, have a few vague sketches or a complete master plan, we can help. You may want a complete oak framed house, a hybrid building where oak and glulam timber are used alongside other building materials such as bricks, or you may want to simply add some warmth and character to your home with an oak vaulted roof, a few oak posts or oak ceiling beams. We create beautiful, period style properties, but also work on designs that are contemporary and avant-guarde. We design, engineer and build bespoke oak framed houses and oak framed extensions, oak framed garden rooms, oak conservatories, oak orangeries, oak framed swimming pool houses and luxury oak garages, as well as residential and commercial glulam timber frame buildings. Our bespoke oak building components, such as luxury, hand finished oak trusses, oak porches, as well as oak beam and post kits are available in design and supply form, to be installed by independent building contractors. See our timber frame projects gallery to see what we do and to get inspired for your next building project. Our family has been creating beautiful oak buildings across the UK and internationally for over 30 years. We pride ourselves in friendly, personal service, fine craftsmanship and meticulous attention to detail. Our clients tell us that you can tell an Oakmasters oak frame just by looking at it. This is because all our oak frames are designed by our in-house oak framing design specialists and hand finished with love and great skill, enhancing the natural beauty of the wood. In addition, for your peace of mind, we offer a 12-year guarantee on all our oak frames. Our recently enhanced manufacturing capability using CNC technology means we have been able to expand our offer and are able to design and manufacture more challenging timber structures in super strong glulam timber. Our list of satisfied clients include many celebrities, as well as construction companies. But why take our word for it? Read some of our customer testimonials to see for yourself.